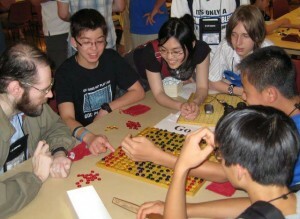 The early registration deadline for this year’s U.S. Go Congress has been extended to June 15. The original deadline was May 31, but “Due to a programming error, we didn’t have rooms available for about a while,” says Congress Director Karen Jordan. “Sorry about that!” Click here to register and you can visit the Springs Go Club website for more info as well. Late payment fees will be $50 after 6/15, $75 after 6/30 and $100 after 7/17. Dubliner John Gibson has an unusual claim to fame, even for a go player. He once played go with Ira Einhorn the infamous “The Unicorn Killer” now serving a life sentence for the 1977 murder of Holly Maddux. In the early ‘80s, Gibson was introduced to “Ben Moore” – a pseudonym of Einhorn’s, while he was on the run — by the Secretary of his Dublin chess club, “and we played a number of games,” says Gibson. 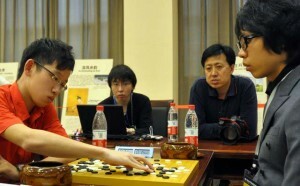 “He was about 7 kyu.” Gibson has been playing go for 34 years and participated in the first World Mind Sports Games in 2008. He attends one of the two Dublin go clubs at least once a week and reports that there are ongoing serious efforts to teach go in Ireland, although go is not supported by the Irish government and so they have to supply all their equipment themselves. 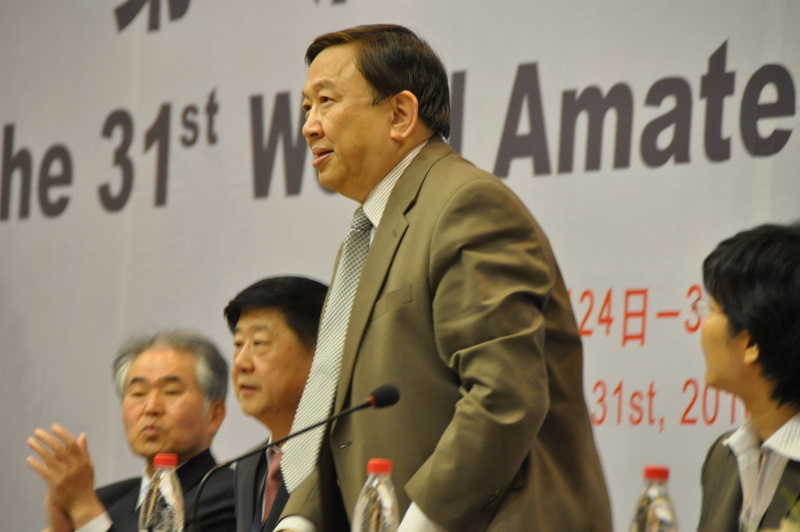 We hope you’ve enjoyed this year’s expanded coverage of the World Amateur Go Championship, as the E-Journal and Ranka online teamed up again this year. 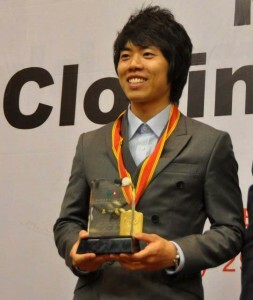 It would not have been possible without the support and help of many dedicated people and organizations, first and foremost the International Go Federation – which does so much to spread go around the world – and its tireless Secretary General Yuki Shigeno, one of the hardest-working (and nicest) go organizers we know. 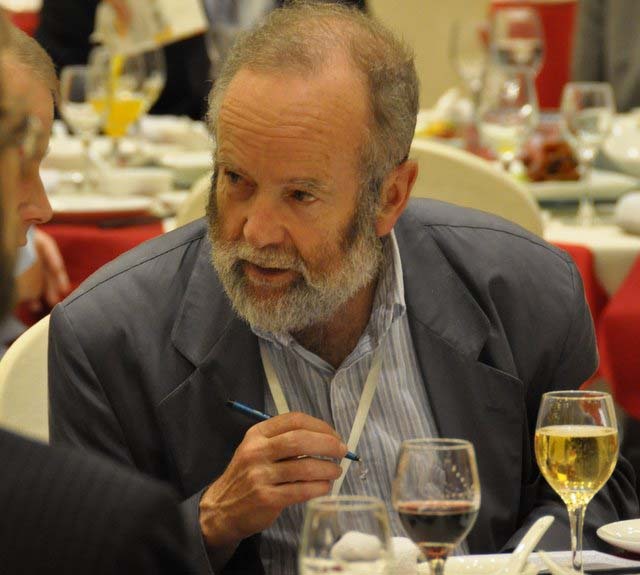 The China Qi-Yuan and it’s Hangzhou Branch hosted a terrific event this year and we look forward to returning in 2012 to explore more go in China. Michael Redmond 9P’s game commentaries were, as always, simply brilliant. His keen insights and ability to home in on the key points of each game this week should be required reading for go players of all strengths. He’s also just a lot of fun to work with and we’re very pleased to announce that he’s generously agreed to become a regular contributor to the E-Journal. We were also very fortunate to have Michael’s wife, Xianxian Niu 3P, contribute game commentaries, as well, working with IGF VP Eduardo Lopez Herrero to provide game commentaries in Spanish. It was once again a real pleasure to get to work side by side with the unflappable Ranka online editor Ivan Vigano, who’s as committed to high-quality go journalism as we are and has a great sense of humor, which makes the long days together during the WAGC pass far too quickly. We cannot praise longtime go writer James Davies too highly: the legion fans of his books already know he’s a great writer, but to see him in action this week as he quietly soaked up the details of each round, caught players for a quick quote and pulled it all together with a depth of knowledge of go’s rules, history and culture was like attending a weeklong master seminar in go writing. Photographer John Pinkerton’s evocative photos speak for themselves, and he continues to be a tried and true fellow go traveler, always up for one more adventure, one more shot. We always seem to pick up a few new team members and this year was no exception. The biggest – and nicest – surprise contributor was of course None Redmond, often referred to as “Michael’s mom” but now, we hope, thanks to her lovely series of player portraits this week, as our very own “Special Correspondent.” We look forward to working with her again in the future. Thanks also to Alain Cano, who put together the terrific standings chart for us, and Jing Ning Xue for translation help. Very special thanks to Thomas Hsiang, who always had time for our questions despite juggling his many roles and responsibility. Thomas should be appointed the AGA’s permanent ambassador to the rest of the world, but he should also be cloned before we burn the poor man out. 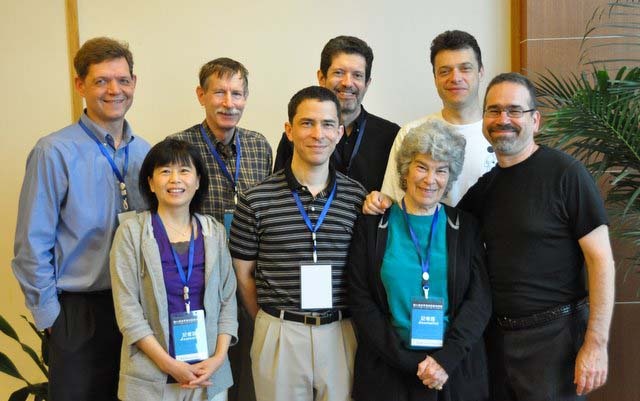 Our thanks and deep gratitude also to the American Go Association’s leadership and membership for your continued strong support for the E-Journal and AGA website, which have become such important resources for go players and organizers around the world. If we have forgotten anyone – and we probably have – we apologize in advance and are confident that you’ll let us know so that we can give credit where it’s due. 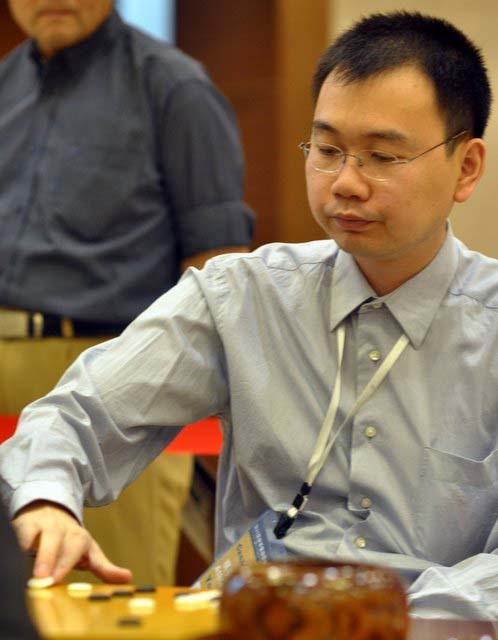 See below for Michael Redmond 9P’s commentaries on four Round 7 game records (click on “link” to download the sgf or “read more” for the online viewer): Nai San Chan 6d (Hong Kong) vs Yongfei Ge 7d (Canada, at right); Alexey Lazarev 6d (Russia) vs Song Hong Suk 7d (S Korea); Ondrej Silt 6d (Czechia) vs Yohei Sato 6d (Japan); Jo Tae Won 7d (N Korea) vs Wang Chen 7d (China). With just one round left to play, Korea appears to have a lock on the 2010 World Amateur Go Championship. 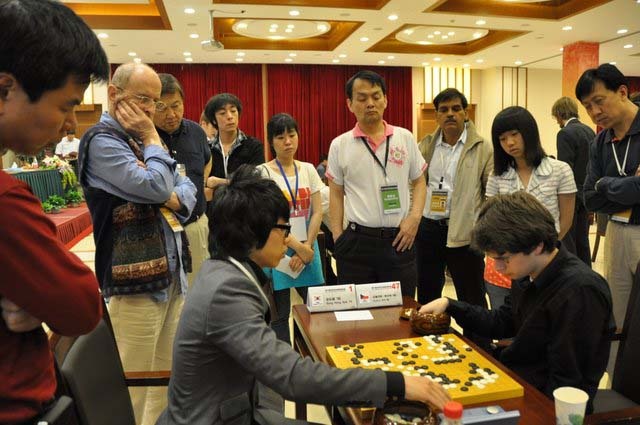 Hongsuk Song (r) defeated Naisan Chan (l) of Hong Kong in Round 6 on Friday and Lazareev Alexey of Russia Saturday morning to extend his thus-far unbroken string of wins to seven. 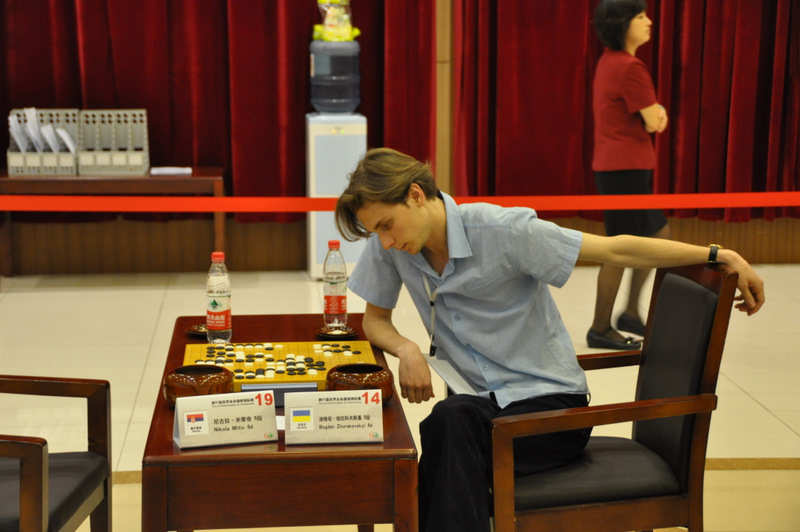 He’s strongly favored in his Round 8 game against Czechia’s Ondrej Silt, who seems to have a solid grip on the best showing for Europe and the West. 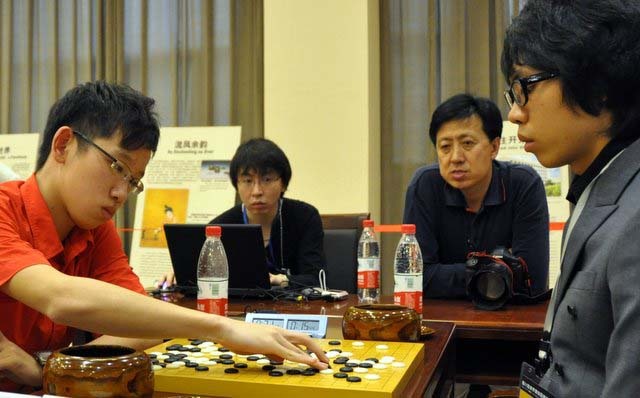 The winner of the China-Hong Kong game should be a shoo-in for second place, and the battle for third is in flux, with Taipei and North Korea in contention. Sweden’s Fredrik Blomback and Hungary’s Pal Balogh have turned in excellent results and should make the top ten, while the chances of North America – the U.S., Canada and Mexico are all 4-3 — breaking back into that group are looking pretty slim. 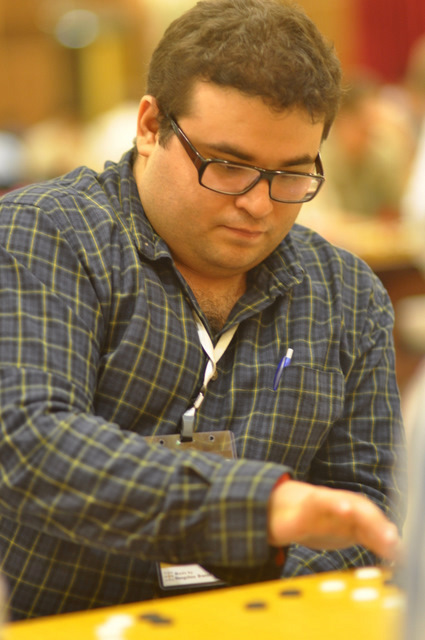 Check out James Davies’ thorough report on Round 6 on Ranka online (with a Round 7 report expected soon) and click here for latest standings.